Marble countertops in Greasby add timeless elegance to your home. Maybe you don’t think of elegance in relation to kitchens, baths, and laundry rooms but consider how much time you spend in those rooms. A lot of that time is spent cleaning the rooms and I firmly believe it takes less energy to clean an elegant room than a plain functional one. You can buy fake marble or composites with a thin top layer of marble but at David Williams, that’s not what we do. We sculpt nature’s own stone into gorgeous worktops from thick slabs of beautiful colourfully veined marble. As luxurious as it is, marble countertops are functional and durable. For all those reasons, marble is a sensible choice. You may hear negatives about marble being soft, porous and that it stains and scratches easily. We don’t think in Greasby marble countertops require much more care than any other stone. It certainly is easier to care for than the once popular butcher block countertops. You may choose polished marble, which is high gloss and highly reflective or honed marble which has mat finish. Honed marble is more porous than polished but it doesn’t matter because we are going to seal whichever you choose. We will show you how to seal it again after a year or so and every year thereafter. That will take care of any worries about stain and scratches. You should wipe up spills and use a cutting board with your marble countertops just as you would with any other countertop material. Marble countertops in Greasby is a worthy investment in your home that offers beauty, pride and pleasure for you indefinitely. You won’t need to replace it every ten years. If after twenty years you choose to sell the home, your beautiful marble countertops will be a high profile selling feature. Contact David Williams or pay us a visit and let us show you samples of our marble and of our workmanship. We’re a family owned business with a 50 year history and experience as stonemasons. We have a talented staff including designers and installers. We can promise you a professional finished product completed to your specifications and complete satisfaction. 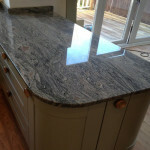 This entry was posted in Marble Worktops and tagged Greasby Marble Countertops, Marble Countertops in Greasby. Bookmark the permalink.